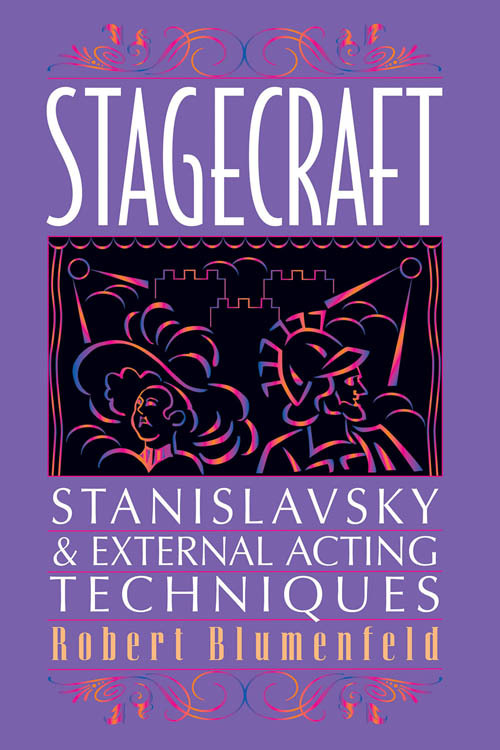 Robert Blumenfeld’s book, Stagecraft: Stanislavsky and External Acting Techniques, is an interesting but at times confusing book which aims to cover a wide range of theatrical topics; the author clearly has a great store of theatrical knowledge, but does not always connect his thoughts as clearly as he might. The book is divided into three sections: in the first, the author discusses subjects such as vocal technique, delivering Shakespearean prose and verse, and performing in comedy and musical theater; in the second, he touches on period acting styles from the Greek and Roman period through the mid-20th century; and in the final, shortest section, he delves briefly into discussions of post-Stanislavskian approaches to theater such as the work of Sanford Meisner and Anne Bogart, among others. Even that brief description of the book’s contents gives a sense of the vast territory Mr. Blumenfeld is attempting to cover. He admirably tries to survey almost every element of an actor’s training: from specific exercises to train one’s voice to what to wear to rehearsal. Unfortunately, this attempt to touch on so many subjects means that some are dealt with so briefly that the reader may wonder why they are included at all. For instance, a short chapter on stage makeup, although it includes interesting references to Stanislavsky’s skill with makeup and Sarah Bernhardt’s advice on accenting one’s features, ultimately feels a bit like the author is skipping a stone across the surface of a much deeper subject. The reader might question other inclusions, such as a three-page review of basic parts of speech (definitions of nouns, verbs, adjectives and so on), when the space might have been given to other topics. The author’s desire to compress a large amount of information into a small number of pages is keenly felt throughout the book. Mr. Blumenfeld, no doubt, has many more books in him; it’s unfortunate that he must here rush from one topic to the next. The chapter on the late 19th century and Victorian England rockets, within the space of a few paragraphs, from discussing Oscar Wilde’s accent, to the accents of U.S. Presidents Taft and Wilson, to Ibsen’s A Doll’s House, to Helen Potter, a 19th century performer who presented impressions of notable people (such as Wilde and Susan B. Anthony, among others) delivering their well-known speeches. The reader is intrigued and entertained, but also occasionally lost in the dizzying rush. There’s no doubt that Mr. Blumenfeld has aimed high; in the book’s second section, in which he touches on the acting style of various historical periods, he sets himself an almost impossible task: what can one realistically say about the topic of acting Shakespeare in a chapter eight pages long? (Granted, the topic of dealing with Shakespeare’s work does turn up in many different sections of the book; somewhat oddly, Shakespeare’s play Julius Caesar is covered in the chapter covering Greek and Roman drama.) Occasionally he presents a bullet-pointed timeline of major historical events during a given period; however, it’s not always clear what the student actor should do with the information. Further, the student actor may be frustrated at the somewhat lopsided focus in parts such as the chapter entitled “Acting In Musical Theater and Opera.” Here, Mr. Blumenfeld really only discusses opera and operetta, with just the briefest reference to modern musical theater; one wonders what the author has to say about the challenges of acting in musicals in the Sondheim and post-Sondheim era. For the average acting student, some of the more arcane – yet fascinating – bits of historical trivia may seem to be shoehorned into the book. The author discusses the 19th century manner of playing Shakespeare, criticizing the grand, melodramatic style as counter to Stanislavsky’s approach. One could question why he includes such a detailed analysis of the style when it seems to be in opposition to the overall thesis of the book. However, the reader can sense Mr. Blumenfeld’s respect and enthusiasm for theatrical history and tradition; even though it appears to be a digression from the book’s primary purpose, it’s apparent he couldn’t bear to leave it out. Besides being the author of a number of books on theater, Mr. Blumenfeld has had a long career as an actor and dialect specialist. In this book, he draws on his own acting experience with various roles when discussing various theatrical techniques; I’m not sure if Mr. Blumenfeld has written a memoir of his career in the theater, but I would certainly be interested to read it. 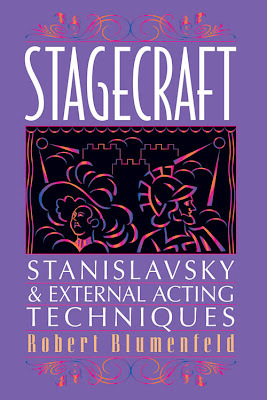 Overall, Stagecraft: Stanislavsky & External Acting Techniques has the admirable intention of being a comprehensive guide for actors, but suffers from occasional lack of organization in the structure and flow of the information presented. The book, with its engaging and lively tone, could prove useful for a theater student needing a quick overview of a wide range of topics, even though the whole is not as coherent as it might be. Rob Hartmann is on the faculty of New York University’s Graduate Musical Theater Writing Program, and has written a number of articles on theater history for the Encyclopedia Americana.